This entry was posted in Uncategorized and tagged Aree, Ari, Baan Mae Yui, Bangkok, Dining, food, Krungthep, Mae Yui, Soi Ari, Thailand by christao408. Bookmark the permalink. Macaroni and satay for lunch? Sounds adventurous! How much? I have not eaten satay for a while. I need to get some now, hehe, it is all your “fault”, Chris. Yummy! 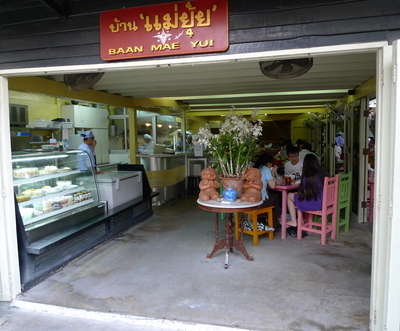 @CurryPuffy – Maybe 200 baht total including drink. @stevew918 – Yeah, yeah… blame the messenger. I gotta be in a certain mood for satay… everything else, I get really bad cravings for but for some reason, satay hits me every so often. Yay for comfort food though! I wish we had one of these restaurants in Toronto. Just sit back with some Tiger / Singha and a bunch of satays. Wooh, tomato sauce and macaroni sounds awesome! Cant imagine what u are going through, but good to see u enjoying food and in good spirits. Take care. @arrian_strider – Thanks for your concern. Actually, life is back to normal now in Bangkok. Monday was the first day of full transportation services, everyone back to work, and the roads once again being jammed with traffic as school starts a new term. Other than a late-night curfew (11 pm to 4 am) that will likely be lifted soon, it feels like normal. 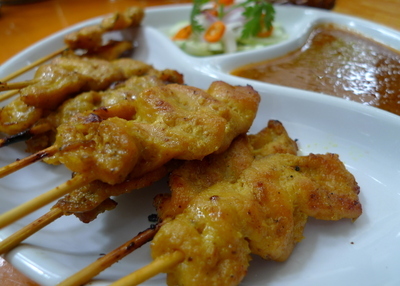 @ElusiveWords – Actually, if eating just satay alone, I’d probably go to a street vendor. But their satay makes a nice accompaniment to other dishes. @Wangium – @lil_squirrel4ever – @iskrak – proof that there is a large fan base for pan fried mac with ketchupy sauce! @moolgishin – So how would you define a “satay mood”? @TheCheshireGrins – Yes, it is such a simple form of barbecue that it is hard to resist. the last mac dish looks very interesting to try…too bad to hear of its downfall in the culinary achievement area….i wonder what would ‘save’ this dish….maybe some cheese? Wow this brings back childhood memories. 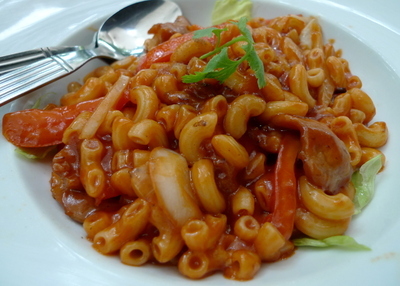 The school lunches in Taiwan would sometimes have the ketchup-y macaroni! Chris, I have tried my hand at Satay, but didn’t turn out as good as I would have liked. Now I see that the meat is basted in coconut milk. Do you have a recipe? May be I will try and make that when the group comes for xanga meet next week. @yang1815 – Exactly. @ZSA_MD – Here are two recipes – one completely authentic and one that is good but requires a little less prep work. I hope you’ll share some pictures of how they turn out!